Indian Shopkeepers Greet Wal-Mart's Expansion Plans With Protests : Goats and Soda "Wal-Mart, come to your senses!" the protesters shouted. These vendors and hawkers are not happy that the retail giant plans to open 50 more stores. 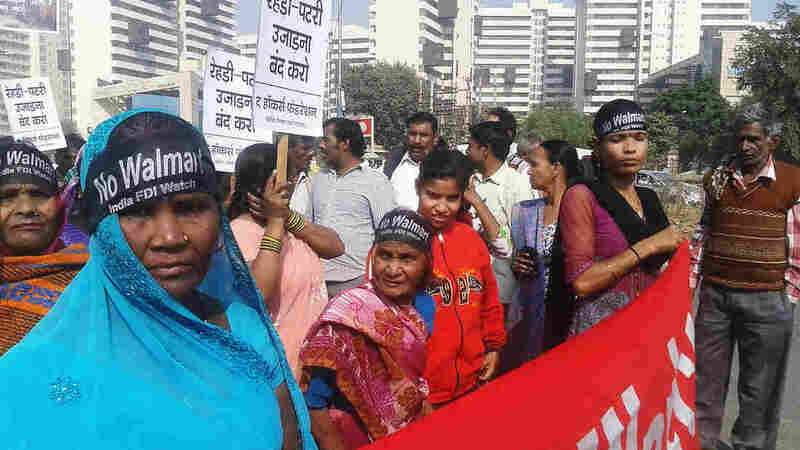 Protesters gather outside Wal-Mart's offices in Gurgaon, India. Their demand: Wal-Mart should build its stores far from markets where they work. A few hundred hawkers and street vendors gathered Wednesday on the side of a dusty, busy road in the northern Indian city of Gurgaon, a few miles from the capital, New Delhi. Some wore black headbands with "No Wal-Mart" signs. Others carried banners that said "Stop uprooting hawkers and vendors." The crowd of protesters walked down the road to the Indian headquarters of Wal-Mart, located in one of many modern, multistoried buildings. They stood outside, chanting "Wal-Mart, down, down!" "Wal-Mart, come to your senses!" Wal-Mart, which opened its first Indian store in 2009, has 20 stores in nine states. Earlier this year, it announced plans to open 50 more. And the vendors and hawkers are nervous about their livelihoods. 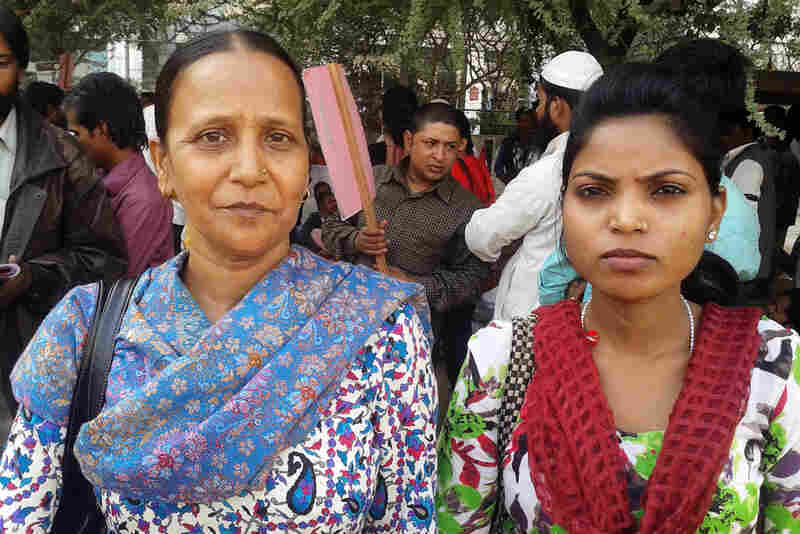 "Our main concern with Wal-Mart and really any of the malls here is that many of them are selling fresh produce, and fish and meat," says Geetanjali Arora of the National Hawker Federation, who helped organize this protest. "That's really affecting people who earn a daily living selling this." Wal-Mart functions very differently in India. It is not a retailer but a membership-based wholesale store called Best Price Modern Wholesale. It works much like Sam's Club, only the members have to be businesses themselves. So in theory, regular folks can't shop there. But an investigation by an Indian news website revealed that the stores do in fact regularly sell products to individual citizens. So a battle between Wal-Mart and small businesses is shaping up. Mom and pop stores, hawkers and vendors remain a big part of the Indian economy. Go to any neighborhood in an Indian city and its sidewalks and markets are lined with little shops and vendors. And they're worried that companies like Wal-Mart will drive them out of business. Wal-Mart recognizes the importance of these stores. Part of the company's strategy is to persuade the small businesses to buy their merchandise ... from Wal-Mart. So far, the company hasn't done too well in India. Some have argued that government regulations designed to protect smaller retailers have kept Wal-Mart from succeeding. And as Forbes reported last year, the retailing giant has run into a range of problems, from "not having the appropriate licenses required to sell different products to not having permits in place while building stores." Then why were the protesters so worried? Ashok Kumar Sahni, who participated in Wednesday's demonstration, has a tea-and-snacks-cart in West Delhi. He's been doing this work for over a decade and is the breadwinner for a family of five. Sahni, 42, says he has no problems with Wal-Mart per se. But his business has suffered since several malls cropped up close to his shop in the past five years. He says he used to make between 500-700 rupees ($8 to $11) a day, "but these days I hardly have a customer." He says people now prefer to eat at malls. Many protesters shared his concerns. Sudha (left), a 42-year-old widow, sells purses at a market in West Delhi. Lately, she says, her business has suffered as more people opt to shop in malls. "Many times we go home empty-handed," says Sudha, a 42-year-old widow who sells purses at a market in West Delhi. "Take this past festival season for example, Diwali. We hardly sold anything. Everyone ran to malls to buy stuff. People going to malls have made it difficult for us!" She's right. This study showed that malls and supermarkets led many vendors and hawkers in Mumbai to shut down. Other reports, like this 2008 study, concluded that large retailers like Wal-Mart would initially hurt vendors and hawkers, especially in the vicinity of the big stores, although it argued that the effect "weakens over time." Ultimately, both Sudha's and Sahni's biggest concern isn't their own daily needs but providing for their children so they can have a better life. "It's every mother and father's duty to help their kids land well," says Sudha. Right now her 23-year-old son works with her, selling purses. Her daughter is in high school. "I want my son and daughter to get good training for good jobs," says Sudha. "But we can do that only if we have some money to spare. If foreign companies stamp on our businesses, where will we go?" That's why the group gathered in Gurgaon had a simple request for Wal-Mart and for their own government: Build big stores and malls far from the markets where we work. "We don't have any other demands," says Sahni. The government can let Wal-Mart and other companies do whatever they want, he says. "But please don't let it affect our livelihoods. That's all."